Traveling east down Carmel Valley Road, leaving the bustling Village behind you the road becomes a bit more narrow and winding as the homes begin to become more sparse and the landscape full of ancient oak trees, open expanses of land and dense canopies above the river. This is the neighborhood of Upper Valley/Cachagua. A ten minute drive east of the Village and the road will split in two directions, East Carmel Valley Road and Cachagua Road. They will intersect again, forming a large oval at Tassajara Road where Carmel Valley Road will continue for miles until eventually turning into Arroyo Seco Road and meeting Hwy 101 in Greenfield. Homes in Upper Valley/Cachagua are positioned on large acreage parcels and are the most remote of the Carmel Valley neighborhoods. For those seeking to live in seclusion and privacy in a rural country setting, the area offers the opportunity to own land with amazing views of the Ventana mountains. This is true Carmel Valley wine country and you will find large vineyards throughout the area. Many of the homes are located on Cachagua Road, the Sky Ranch Estates, and the gated Asoleado community. You will feel as if you live within the confines of a state park with the stunning vistas, quiet solitude and unobstructed panoramic expanses of land. Those who reside in Cachagua do so with the intent to be free of traffic, congestion, and the stresses of everyday life. What they give up in terms of convenience, accessibility, close neighbors and the benefits of modern life, they view as a sacrifice worth making to live in close connection with nature. Many employ alternative energy methods such as solar, taking advantage of the abundance of sunny days in the Valley. Your choices of restaurants and shopping will be limited in this remote locale as residents make trips to Carmel Valley Village and Mid Valley to stock up on essentials. You will find it best to have an ample supply of food and water always at hand. However it is worth mentioning one landmark of the area, the Cachagua General Store. Not actually a store but a gourmet dining establishment, this off the beaten track eatery is considered a culinary gem by many who have experienced its Monday night dinners or Sunday brunches. Everything on the menu is locally sourced, grown or farmed and is run by Chef Mike Jones of A Moveable Feast Catering. Eccentric and boisterous it is filled with people from all walks of life coming together to share a feast for the senses over bottles of excellent local wines to the tune of local musicians. The UC Hastings Reserve is also located in the Upper Carmel Valley. Part of the UC Natural Reserve System, this reserve is a biological field station of the Museum of Vertebrate Zoology. The land was historically a cattle ranch and was donated by the Hastings family. It is unique in that it has over 70 years of intensive observation and collection efforts and has been an area protected from human impact in which invertebrates, plants and vertebrates have been studied and over 30 long-term data sets have been compiled. In nearby proximity to Hastings, one of the few populations of the California tiger salamander lives as well as the endangered Red-legged frog. Researchers are housed in cabins and ranch houses on the property and 25 buildings are currently being maintained on the site. The Cachagua Community Center located in upper Carmel Valley next to the Carmel River, offers a 15 acre park and community center for recreation and socializing. Many native-American artifacts from the Esselen tribe have been found at this site. The Esselen homeland once encompassed approximately 750 square miles of the Ventana Wilderness and their presence in Central California dates back 10,000 years. 7 homes in this neighborhood sold in 2018. The most expensive home to sell was Rolling Ridge Ranch, a 154+ acre property with a 2 bedroom, 3 bathroom, 1,930 SqFt main house and a fully equipped horse barn complete this property that sold for 1.675 million. The least expensive home sold for 421K for a 1 bedroom, 1 bathroom, 768 SqFt home on a 10+acre lot. 10 homes sold in this neighborhood in 2017. The most expensive home that sold, sold for 2.065 million for a 104 acre property with a 5 bedroom, 7.5 bathroom residence with 3,987 SqFt of living space, complete with pool, guest house, stable facilities and barn. The least expensive home sold for 320K for a river front bungalow with 2 bedrooms, 1 bathroom, 911 SqFt of living space on .63 acres. 11 homes sold in this neighborhood in 2016. The most expensive home that sold, sold for 1.375 million for a 3 bedroom, 3 bathroom home with 1,906 SqFt of living space on 10.1+acres, complete with horse arena, barn and detached 1 bedroom, 1 bathroom guest house. The least expensive home that sold, sold for 165K for a bank-owned, Carmel river front lot with a fixer cabin. In 2015, 9 homes sold in this neighborhood. The most expensive home that sold, sold for 955K for a 2 bedroom, 2 bathroom, Spanish-style home with 1,280 SqFt of living space on 38+acres plus 1 bedroom, 1 bathroom guest house. The least expensive home sold for 230K for a 10.2+acre lot with 3 ancillary structures totaling 1,600 SqFt. In 2014, 14 homes sold in this neighborhood. The most expensive home sold for 980K for 3 bedrooms, 3 bathrooms and 1,906 Sqft of living space on a 10+ acre lot. The lease expensive home sold for 156K for an 8 acre lot. In 2013, the most expensive home sold in the neighborhood sold for 2.4 million and was a 4,828 SqFt home on a 8,9 acre lot, while the least expensive sold for 110K and was a 819 SqFt cabin on 45,650 SqFt of land. In 2012, 7 homes sold in this neighborhood. The most expensive home sold for 1.15 million for a 3 bedroom, 2 bathroom home with 2,526 SqFt of living space and situated on a 217,800 SqFt lot in a private gated community with tennis courts. The least expensive home that sold was a 2 bedroom, 2 bathroom home which sold for $415,000 and had a small swimming pool and incredible mountain views. For a detailed analysis of Carmel Valley real estate sales, check out our monthly Community Market Reports. For all available Carmel Valley real estate, click here. Living in the Upper Valley/Cachagua is not for everyone but for those looking for remote country living in the beautiful Carmel Valley, it is an ideal location. For those closest to the Village you still maintain a reasonable distance to traveling into Carmel and Monterey for recreation, work, medical appointments and necessities. For those further out in the Valley it can be quite a trek, though possible. 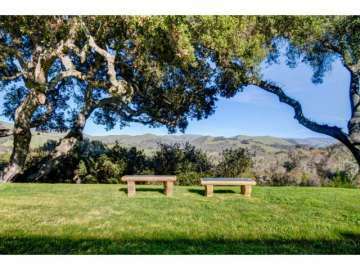 Living in the Upper Valley /Cachagua allows buyers to own large acreage for pricing substantially lower than in the more highly populated areas of Carmel Valley. It is very suitable for those who are looking for ranch land, the opportunity to develop a vineyard, horses or a compound to escape to for a peaceful retreat.